These are just my notes. Please buy the book. A good place to buy older books is Abebooks.com. Perhaps the most famous sermon ever preached in America was the Sinners in the Hand of an Angry God sermon by Jonathan Edwards. It is filled with images of God’s divine wrath being poured upon sinners. God’s wrath against sinners is shown to be relentless and without end—throughout eternity. This type of preaching that stresses the fierce wrath of God is not seen much today (Sproul wrote this in 1985 and it is even more true today) with our focus on self-improvement (preachers today like Joel Osteen—more on him in a later post) and our reluctance in preaching against sin. We tend to ignore the fact that God is holy and just. But even if He is, we console ourselves with the fact that His love and mercy would override His holiness and justice. We think that if we try to do good and we can look around and find others that are worse sinners than us, that we are okay. Modern thinking has regressed to the point that you don’t have to do good, you just have to try to do good. We allow ourselves to fool ourselves. If we think soberly and look at what the Bible says about the character of God, we will see that if God is holy, if He has an ounce of character, if He is truly God, how could He possibly be anything but angry with us? We sin and commit treason against a holy and just God. We violate, insult, and trample on His holiness, justice, patience, and grace. Seriously, how can God be pleased with that? He isn’t. Jonathan Edwards understood the holiness and justice of God and tried to warn sinners that they had much to fear from such a God. Edwards didn’t do this because he sadistically enjoyed scaring people, but he did it out of compassion. He loved his congregation enough to warn them of the wrath to come if they did not repent and believe. Jonathan Edwards understood the holiness and justice of God and tried to warn sinners that they had much to fear from such a God. Edwards relentlessly attacks the conscience of sinners with graphic images from the Bible in order to warn them of their impending fate should they not repent. He says that sinners are walking on slippery places and are in danger of falling without a moment’s notice. 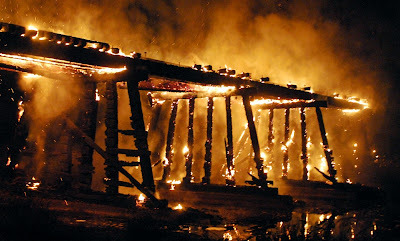 He says that they are walking across the pit of hell on a wooden bridge of rotten planks that may break at any second. He warns that God’s bow is bent and His arrows of wrath are pointed at their hearts. He describes the wrath of God as a great waters rushing and being held by a dam, and if that dam should break, the sinner would be engulfed by its raging waters. He says that man’s “righteousness” would do no more to stop a sinner from plummeting into hell than a spider web would stop a falling boulder. 1. Whose wrath it is. The wrath of man is finite, but God’s wrath is infinite. It lasts for eternity. 2. The fierceness of God’s wrath. In hell there is no mercy given. God is not just annoyed or disappointed with sin, He has a consuming rage against those who do not repent. 3. It is an everlasting wrath. There is no end to the wrath of God against those in hell. If we were exposed to God’s fury for even a moment, it would be more than we could bear. It is unfathomable then to imagine His wrath for all of eternity. How do you react to Edwards’ sermon? Does it provoke a sense of fear? Does it make you angry? Do you consider the wrath of God as a primitive or obscene concept? How do you feel about the concepts of hell and everlasting punishment? If you feel negatively about these things, you worship a god different from the holy God of the Bible. The God of the Bible is holy and just. Because of His holiness and justice, He must punish sin or He will no longer be holy and just. A god of love who has no wrath is not God at all. If you think God is love and that He should not punish people, then this god you have created and worship is an idol—one that more resembles Santa Claus than the God of the Bible. If you despise the justice of God you are not a Christian. If you hate the wrath of God, it is because you hate God yourself. A god of love who has no wrath is not God at all. If you think God is love and that He should not punish people, then this god you have created and worship is an idol—one that more resembles Santa Claus than the God of the Bible. If you despise the justice of God you are not a Christian. If you hate the wrath of God, it is because you hate God yourself. 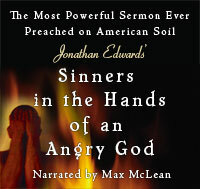 Edwards preached a sermon as sort of a sequel to Sinners in the Hand of an Angry God. It was entitled, Men Naturally God’s Enemies. If I could presume to improve the title, I would call it God in the Hands of Angry Sinners. If we are unconverted, one thing is absolutely certain: we hate God. We are God’s enemies. It is natural for our sinful nature to hate God. Many will disagree with this statement. We may agree that we are sinners and do not love God as we should, but we do not think that we hate God. Romans 5:10 says, “For if while we were enemies we were reconciled to God through the death of His Son.” We are enemies of God until we are reconciled or brought together by Jesus’ sacrifice. Without Jesus there can be no reconciliation. This theme of reconciliation is the recurring theme of the New Testament. We must be reconciled because we are enemies of God and hate God. How do we hate God? We reveal our enmity and hatred of God by the low regard we have for Him. We do not feel He is worthy of our total devotion, so we do not give it to Him. We do not like to think about God, we do not enjoy reading His Word, we find it a burden to pray, and we go through the motions to worship God. Our natural tendency is to flee as far away from God as we can, just as a criminal stays as far away from the cops as he can. We reveal our enmity and hatred of God by the low regard we have for Him. We do not feel He is worthy of our total devotion, so we do not give it to Him. Our sinful nature makes us enemies of God. We oppose His rule over us. We have no affection for Him. His holiness is of no concern to us. Edwards said that it is not enough to say that we are God’s enemies; He is our enemy as well. His holiness, righteousness, and justice represent the highest threat to our sinful desires. We should fear His hatred of sin and rebellion and the fact that His righteousness and justice demand that our sin be punished. No amount of persuasion or argument can cause to love God. We despise His very existence and would do anything in our power to rid the universe of His holy presence. We want a place without God’s laws infringing on our personal freedoms. This place without God is hell. We want hell. But we do not want God. If God were to expose His life to us, He would not be safe for a second. We would kill Him. This seems preposterous until we look back at what happened to Christ. He was not simply killed, He was murdered by the hands of malicious men who were offended by his holiness. We know that it was His human nature and not His divine nature that died on that cross. If God had exposed His divine nature, then Christ would still be dead. This would be the ultimate revolution in which God would be dead and man would be king. If we are Christians then we no longer hate God. We love God. We love God because we have been reconciled. We are no longer enemies, but friends. However, we must be warned that our fallen natures were not destroyed when we were saved. We still have this fallen nature that we must struggle with every day. We still have a corner of our soul that hates God. We see its hatred of God in our continued sin and we see it in our lethargic worship. It even manifests itself in our theology. It has been said that historically there are only three types of theology within the church: Pelagianism, Semi-Pelagianism, and Augustinianism. Pelagianism is a naturalistic religion that totally discredits the supernatural. Today we call this liberalism. Pelagianism is not only not Christian, it is anti-Christian. It not only misses the mark, it is totally opposed to Christianity. The fact that it has a stranglehold on so many churches is a testament to man’s hatred of a holy God. It is a theology of unbelief. It does not believe in the supernatural or in miracles. There is no deity of Christ, no resurrection, and no atonement. It is paganism masquerading as religion. Semi-Pelagianism is “almost Christian.” It is clearly Christian in its belief in the deity of Christ and its confidence in the atonement, resurrection, ascension, and return of Jesus. Yet, even with all its virtues, Semi-Pelagianism still represents a theology of compromise. It is deficient in its understanding of God. Even though it salutes God’s holiness and loudly states its belief in God’s sovereignty, it foolishly believes in man’s ability to reconcile himself to God. This theology of Semi-Pelagianism represents the majority of church-goers today and those who read this book (and blog). Semi-Pelagianism wrongly believes in decisionism, that a man is able to decide to be born again. It believes that a fallen man who is an enemy of God can be persuaded to be saved even before his sinful heart is changed. Nowhere in the Bible does Jesus nor any of the apostles preach the Gospel and then ask, “Who would like to pray a prayer and be saved?” They did not try to persuade sinners and ask them to pray a prayer, rather they commanded men to repent and turn from their sin and to believe and trust in Christ’s righteousness and mercy and not their own works. Nowhere in the Bible does Jesus or any of the apostles preach the Gospel and then ask, “Who would like to pray a prayer and be saved?” They did not try to persuade sinners and ask them to pray a prayer, rather they commanded men to repent and turn from their sin and to believe and trust in Christ’s righteousness and mercy and not their own works. A sound theology must be one with grace as its central theme. Helpless sinners cannot enter into heaven without the assistance of a merciful God. When we understand the character and holiness of God, then we will begin to understand our own depravity and sinful nature. We may not like God’s wrath and justice, but until we realize these concepts, we will never appreciate just how much a merciful God has done to allow for our reconciliation. Even Edwards’ sermon did not focus on the fiery pit of hell but on the hand of God who holds us and rescues us from it. God’s hands are gracious and they alone have the power to save us from certain destruction. How can sinful man love a holy God? He can’t. It is impossible for our unholy and sinful nature to love that which is holy. Romans 8:7 says, "For the mind that is set on the flesh is hostile to God, for it does not submit to God's law; indeed, it cannot." Sinful man cannot love a holy God, therefore he must invent a god who is less concerned about our sin—an unholy god. Unless God Himself shows us grace and transforms us, we will not be able to love a holy God. It is He who takes the initiative to reconcile us to Himself. Without Him we are incapable of righteousness and are forever doomed to be separated from His holiness. Sinful man cannot love a holy God, therefore he must invent a god who is less concerned about our sin—an unholy god. Unless God Himself shows us grace and transforms us, we will not be able to love a holy God. We can only love Him because He first loved us. It takes grace to love a holy God—a grace strong enough to transform our hearts of stone into hearts of flesh and to awaken our dead souls. We still tremble in the presence of a holy God—though we have been transformed, we are still burdened by our sinful nature. Yet as we grow in our knowledge of Him, we grow in our love for Him. We gain a deeper appreciation of His holiness and his grace. We learn that He is truly worthy of our devotion. We revere His name all the more. We can love Him as we are able to see His loveliness and His majesty. We can now obey him because His Holy Spirit is within us. He is holy, holy, holy…. Thanks for checking out the series on the Holiness of God by R. C. Sproul. My next series of posts will be on the Gospel.